At the start of the Bolivian school year in February, 10-year-old Daniel was demotivated and depressed. He could neither read nor write and he struggled with the simplest of sums. With his confidence at rock bottom, he refused to complete any of the tasks his teacher set. “I can’t do it, I don’t understand, I don’t want to know,” he kept saying. Daniel had fallen far behind his classmates, most of whom could already read and write by the age of six, and he felt there was no way he would ever catch up. Frustrated and fed up, he caused trouble in the classroom by aggravating and hitting the other children instead of trying to learn. When he took a two-hour exam to test his reading, writing and mathematical skills, the full extent of his problems became clear and he was offered a place on a school tutoring programme that Proyecto Horizonte runs for children who have learning difficulties or have slipped behind their peers in some subjects. Since then Daniel has been attending extra classes in the morning to get up to scratch on the basics while continuing to attend mainstream lessons in the afternoon. 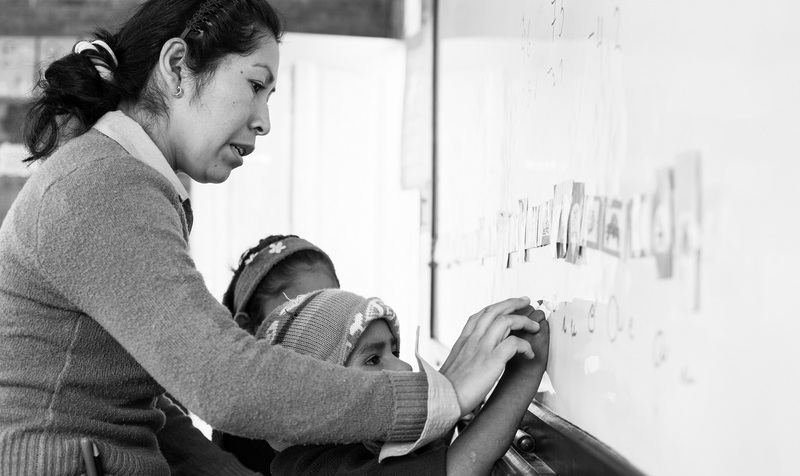 Maria Teresa Rodríguez Heredia, who leads the tutoring programme, says one of the problems is that teachers in the mainstream classes use the board a lot and so often fail to explain concepts or exercises in a way that children like Daniel can understand. “The teacher just goes over to the board and says ‘we’re going to do divisions today’ and then writes out a few divisions and says ‘do an exercise – do it like this and hey presto! '” she explains, adding that many of her pupils struggle to get to grips with material unless it is taught in a way that they can actually see and experience. So in her classes, mathematical concepts are explained visually. In a lesson on division, for example, students have fun sharing small buttons out between cut-out paper boys and girls. They also play didactic computer games to boost their reading skills. Thanks to these interactive learning strategies, specialised one-on-one teaching time and a lot of encouragement, reassurance and praise, Daniel is now nothing like the dejected, demoralised boy who trudged into Maria Teresa’s classroom for the first time earlier this year. He now turns up to school full of enthusiasm, reads and writes fluently, oozes confidence and loves to solve all kinds of mathematical problems. And now that he knows he’s capable of doing his schoolwork, he no longer feels the need to irritate or hurt his fellow pupils. “He behaves so much better now than he used to – he controls himself and he pays attention to me and respects me,” Maria Teresa says. What’s more, he’s even trying to help his classmates out now, showing them how to do their schoolwork and correcting them when they make mistakes. Daniel is one of a huge number of children who have beaten their gremlins by learning how to read and write through the tutoring programme. Of the 130 pupils Maria Teresa has worked with this year, 115 have shown signs of significant improvement and many of her former students are now achieving good grades at school. Without the extra lessons, Daniel’s story could have been very different. Maria Teresa says some struggling students who don’t get help in time simply leave school early, often encouraged by their parents, who tell them they are no good at school and should just go to work with them instead. To help us help more children like Daniel, please click here. By giving even a small amount you can help to keep children like him in school and on track for a brighter future.